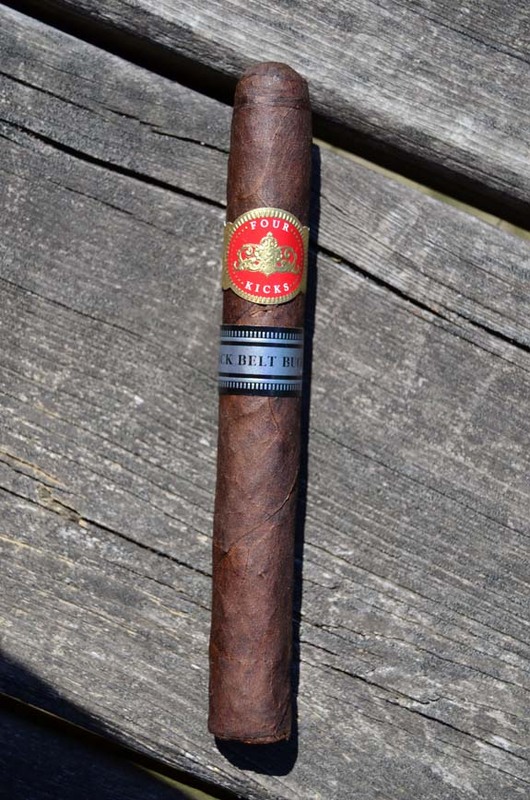 On November 7, 2015, Famous Smoke Shop announced a shop exclusive in partnership with Crowned Heads, a company that has intrigued me since day one and one that has steadily gained my respect with each release since their freshman release in 2011 of Four Kicks. 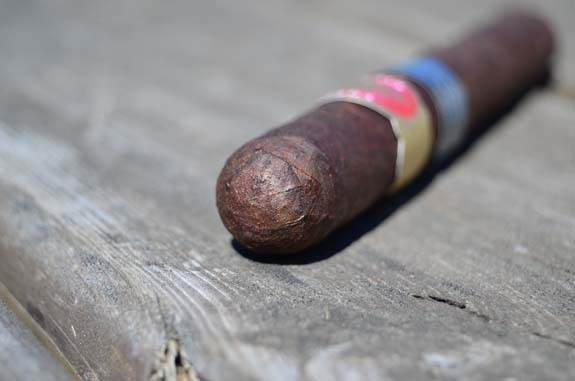 The new line, exclusive to Famous, is built on the original Four Kicks blend exchanging the Ecuadorian Habano wrapper with Connecticut Broadleaf named Four Kicks Black Belt Buckle. 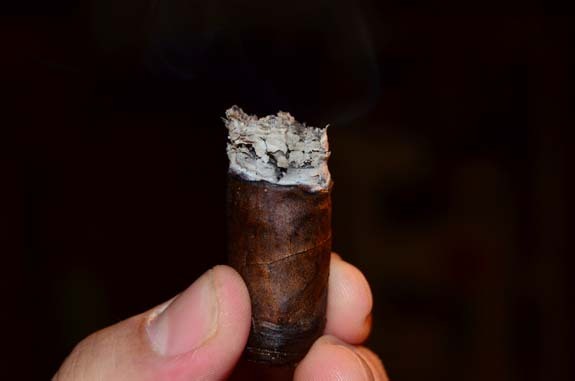 Originally released on December 12th in a single vitola, Corona Gorda, with total production of 10,000 cigars, the Black Belt Buckle is now (as of April 2016) a regular production cigar expanded to a total of three vitolas with the addition of a Robusto and Toro to the line-up. You purchase your own Black Belt Buckle from our good friends at Famous Smoke Shop. 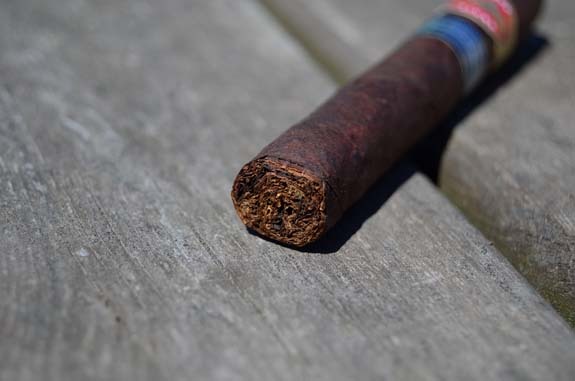 The Four Kicks BBB features a dark brown Connecticut Broadleaf wrapper leaf that has a deep red hue and even darker watermarks/imperfections all over the leaf. Sugar-like crystals glisten on the wrapper that is full of bumps, a few stitch-like veins, and a nice amount of oils that is easily felt on the fingertips. Bringing the cigar to my nose, there is a pungent vinegar on the wrapper. Right behind the vinegar there is a faint chocolate. 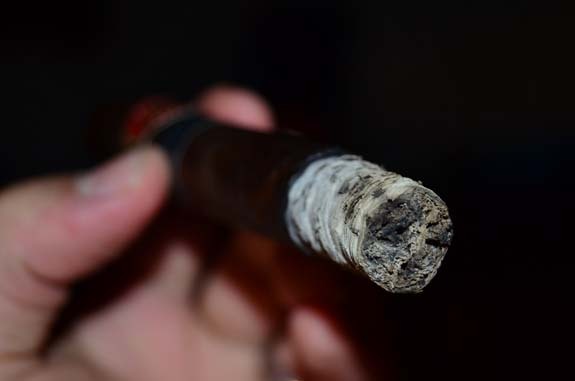 A much more welcoming aroma is found on the foot of the cigar with big notes of chocolate, caramel, and graham cracker. Sections of the cap are a bit rough looking, but it clips easily enough opening up a perfect draw. Rich potpourri spices, some chocolate, and earth come across on the cold draw. After toasting the foot of the Four Kicks Black Belt Buckle with a wooden match, the cigar is underway. Right out of the gate, the BBB is opening up much fuller than the original version with notes of espresso, black pepper, cedar, a touch of saltiness, and just enough of an unidentifiable sweetness to bring a nice balance to everything. The black pepper is accentuated as I pass the smoke through my sinuses. Right alongside the black pepper on the finish there is a cocoa that seems to be inching its way into the main profile. The burn-line is thin and edgy, but overall doing well. Transitioning into the second third of the Black Belt Buckle, a Famous Smoke Shop exclusive, a new yeasty flavor tags on to the profile from earlier and the sweetness has gained ground. The sweetness seems to be tied to the the yeasty, bread flavor. Right at the halfway point, the flavors develop as raisin and cinnamon make an appearance. The mixture of the yeasty bread, cinnamon, and raisin makes me think of a cinnamon raisin bagel. An abundant supply of smoke coats all surfaces in my mouth with each effortless, small draw delivering full, savory flavors. There is an ebb and flow going on with the black pepper that was toned down in the second third, but is now back in force. Deep woodsy notes, espresso, and a hefty sweetness are carrying the Four Kick Black Belt Buckle to the nub. While burn-line was never perfect, it was also never a concern. It is no secret that I am a huge fan of Connecticut Broadleaf. So when Famous announced the new Four Kick Black Belt Buckle as a shop exclusive, I knew it was a cigar I had to get my hands on. And thank to Cory Grover over at Famous for making that possible. 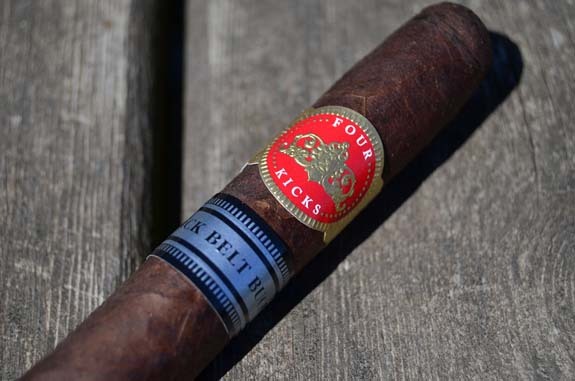 The Broadleaf wrapper brought a new dimension to the Four Kicks brand. From start to finish, the Four Kicks Black Belt Buckle grabbed my attention and never let go. The flavors were darker and fuller than the original Four Kicks, but just as enjoyable and possibly even more so. Performance wise, the BBB burned an hour and 20 minutes delivering mouthfuls of smoke, an effortless draw, and a meandering burn that never got too far off course to require a touch-up. 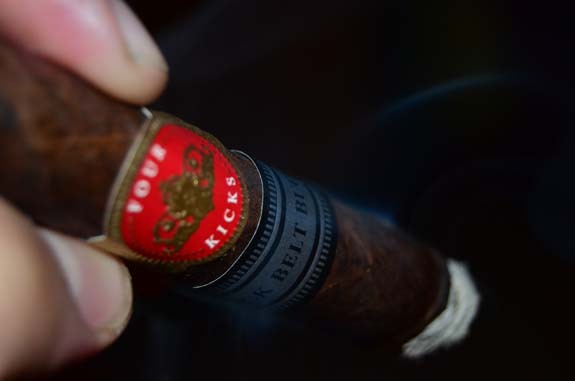 The Four Kicks is a cigar that I can easily recommend a 20 count box purchase of, but, if your budget doesn’t allow, consider a 10 count box for under $70.00.